One of the most apparent byproducts from the war in Liberia is the profusion of issues facing children today. Children who were former child soldiers or displaced during the war have been unable to receive the services they need to return to normalcy. As a result, child are facing abuse, sexual violence and exploitation, forced labor, kidnapping and a lack of basic necessities among other issues. Though each of these issues is considered a major violation of children’s rights and an abuse against children, they often exist in conjunction with other issues. Additionally, there is a cyclical pattern between these issues that make them particularly difficult to address. Since the war, Liberia has been working to develop an infrastructure to formally support child protection. However, the implementation of the policies put in place has not yet fully come to fruition. Many of the gaps exist in the formal structures and their connection to the informal community-based systems. Even the structures that do exist are either difficult to access, or are not trusted by the community. 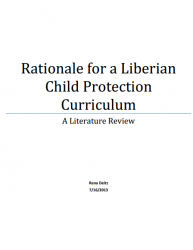 As such, it is necessary that child protection professionals have access to training that is specific to Liberia and its’ needs.